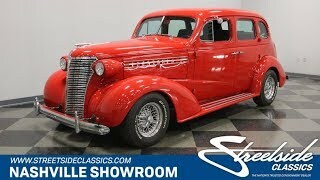 Hi, I am interested in your 1938 Chevrolet Master (stock #1153-NSH) listed on Autotrader for $31,995. I'd like to get more information about this vehicle and confirm its availability. Got family? Want to arrive in style at Grandmas house instead of in a cookie cutter SUV? Then check this Master Deluxe out. Its roomy, comfortable, and is a real attention getter wherever you show up with it. With retro all the rage these days, why dont the manufacturers build a retro one of these? It would be a hit! So, while we wait for Detroit to catch up, you can check out the classic good looks of this one. It is Red and chromed and lowered down just a bit from the original. It has a bit of chassis rake which gives it a little attitude along with some suspension travel to soak up the kids and luggage for a trip to Grandmas. Plenty of glass area means everyone will be able to enjoy the view on the way over the river and through the woods. People on Main Street will enjoy the view of those teardrop fenders, wire wheels, and suicide doors. Up front, a sweet looking hood ornament sits on top of a tall chrome grill that sweeps back with separate headlights in teardrop housings that echo the look of the fenders. Of course, running boards connect those fenders and simple chrome bumpers both front and rear underline everything. Open the door and you will find a comfortable place to travel. It has been updated with some modern technology without going over the top with it. The door panel sets the tone in Gray cloth with dark gray upper and lowers. The high back bucket seats up front are power operated giving the driver and navigator the adjustability to get plenty comfortable for the ride. Power steering means that the big wheel of the original car can be replaced with a smaller Z28 steering wheel mounted on a tilt column with cruise control and the shifter for the automatic transmission. The dash panel is retro sweet in gorgeous wood with modern tech like Stewart Warner gauges and a Pioneer sound system for your listening pleasure installed. There is air conditioning to keep everyone cool on those hot summer days and the trunk can handle lots of luggage so everyone will have room to stretch out in the back seat too. Open up the hood and you will find a tried and true 350 cubic inch motor nestled down in a neat and clean engine bay. An aluminum oval air filter housing sits on top of a Carter carburetor and feeds the engine through a stock intake. Chrome valve covers add a splash of flash to the engine as do a few other polished pieces like brackets, wire looms, and master cylinder cover. An HEI ignition system handles getting good spark to the cylinders and stock exhaust manifolds flow back through dual mufflers while an aluminum radiator keeps things running cool. A 3-speed automatic transmission gets the power back to a solid axle on leaf springs and power rack and pinion steering works through control arms and coil springs with a sway bar up front to make this car handle really well. Power front disc brakes insure good stopping ability and those chrome wire wheels mount 215/70R14 tires all around. Good looking, roomy, comfortable, and unique. Come on down and check it out. You might decide to take it home and load it up for a trip to Grandmas house.